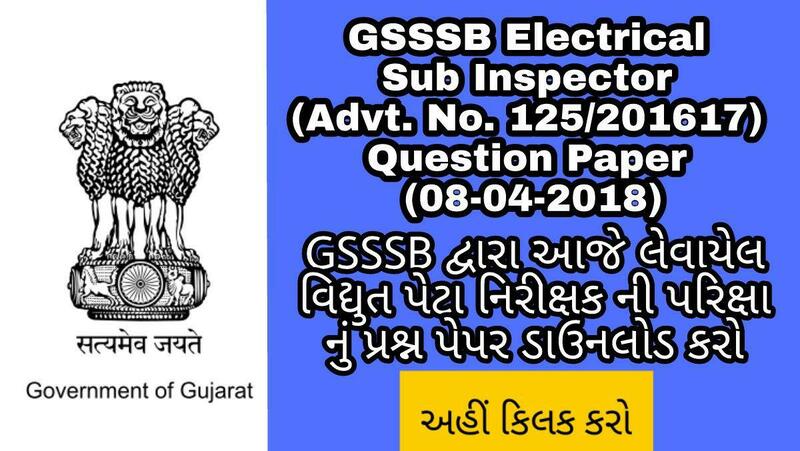 Today GSSSB - Gujarat Gaun Seva Pasandagi Mandal was held th Examination of Electrical Sub Inspector Class 3 on the Date of 8th April 2018. The Mode of Examination is Offline OMR Type Examination. Total Marks of this Examination is 150 Marks and Total 150 questions available in this examination. Each Question Carring One Marks. The Advertisemnt number for this Examination is 125 / 201617. 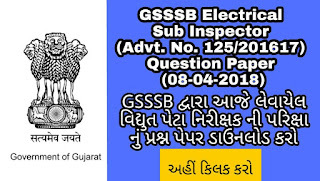 The Question Paper and Answer Key is Available for this Examination Now.. Answer key of Electrical Sub Inspector Class 3 will be available soon. To Download Question Paper and Answer Key Just Visit on Link Given In Below.